The Port House is the head office of the Antwerp Port Authority. The office building is at the Zaha Hadidplein 1, which has been named after architect Dame Zaha Hadid, who died unexpectedly a couple of months before completion of the building. 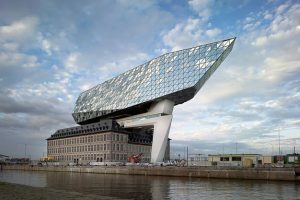 The new building symbolises the dynamic, reliable, ambitious and innovative nature of the Port of Antwerp. It is the daily workplace of 500 employees of the Port Authority and it acts as a meeting place for the many international contacts of the Antwerp port community. The old fire station on the site, a protected replica of a former Hanseatic house, had to be integrated in the new project. The eventual design is the result of several studies. The result consists of two entwined main volumes. A dynamic beam-shaped volume rises above the existing building and in a visual sense reinforces the former fire station, now a component of the new constellation. An external bridge integrates the existing building with the new expansion. The expansion has a glass-covered façade which shimmers like waves and thus reflects the complex interaction of shades and colours in the air. This is a referral to the building’s exceptional location surrounded by water. The perception of a cut glass mass to give the new building a sparkling appearance refers to Antwerp, the diamond city. How to reach the venue ? By car: Zaha Hadidplein 1, 2030 Antwerp. Choice of 2 car parks – underground (entrance Mexicostraat) or “Straatsburg” car park, off the Merantistraat. Remember that getting around by car in Antwerp is very difficult, sometimes impossible. If you have registered and paid for this event, let the organisers know, preferably by e-mail, and we will arrange for more detailed instructions and a map. The nearest stops are: bus stop Ferdinanduspolder if it is in use (at time of writing closed for roadworks). Otherwise bus 620 to 776 or tram 6 to Kinepolis, then a 15 minute walk. If you’re feeling energetic, there is a Velo station at the Port House – you can rent Velo bikes at dozens of places in the city.